The German Computerwoche magazine hosted last week already the fourth time its annual Best-In-Cloud award. It was my pleasure and honor to sit in the jury of this award. Here are the winners of this year and what I personally found most exciting with them. MID/BNP Paribas Real Estate: “smartfacts – The Model Warehouse” offers a aggregation of business process models across nearly all modelling tools on the market. Users see the relation between models. First and foremost, the customer on stage was really enthusiastic about the solution! The jury and the audience could feel that they saw no other chance than going with MID to innovate across multiple teams in BNP Paribas Real Estate – and hopefully soon across the rest of the bank. MID is also a great example of a mid-size German software firm, which did not just compete with large international firms such as Software AG with its ARIS modelling tool in this case. Instead, MID created basically the cloud service which puts all different models in one searchable context – something that none of the major vendors would do, as they mostly try to lock people into their own model tool. The Smartfacts service is the first of its kind at all. Amazon Web Services & direkt Gruppe GmbH/Talanx AG: The major insurance group runs its risk and forecasting simulations on AWS. While this is not (yet) customer or compliance relevant data, it is still an impressive example. The business side asked initially for capacity of about 2000 servers. Meanwhile the demand increased over 11.000 virtual servers. Most impressive was not only the little effort to satisfy this hunger, but the economics around this. While the number of compute resources grew basically linear over the last two years, the cost suddenly started to decline. An excellent proof of Moore’s law. direkt Gruppe/Talanx operated its AWS instance until now in Ireland, and could not wait until using the new AWS data centres in Frankfurt launched on Thursday Nov 23 at 3pm CET. 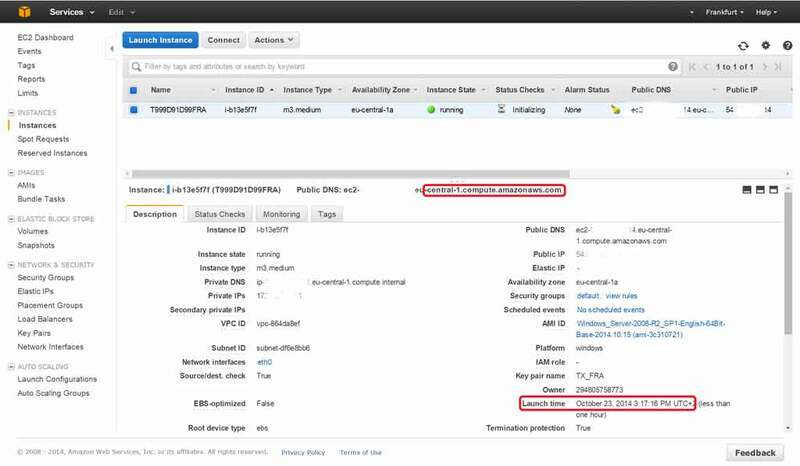 The screenshot shows the first instance started by direkt Gruppe / Talanx at 3:17pm, only 17 minutes after the AWS Frankfurt data centres got online. With all excitement, AWS has still some challenges and limitations for the German market outlined in my recent Forrester report. Claranet/Leica: There are many cloud service for digital picture management and print servicess available. But, none of it comes from a brand having professional photographers and premium quality in mind such as Leica. The peta-byte scale of high resolution pictures was highly professionally managed by Claranet. All together a impressive example, how Leica adds a digital business to their traditional, physical photo equipment business. If the platform expose in the future PaaS capabilities to third-party developers, it has major potential to attract apps around professional photography in the future. Lintra Solutions/Socura/Malteser: All 48.000 voluntary workers of the Malteser Hilfsdienst, a major German non-profit organization similar to the Red-Cross, are working with the cloud service created by Lintra called Team Suite 2.0. Schedules of duty, material management, education, events and catastrophe plans&staffing are managed out of the cloud. Linear built the solution on the basis of Microsoft’s Office 365 and other service based on Microsoft technology. Its not a secret that I am personally not a friend of Microsoft’s Office 365 solutions. Their legal challenges are still open and the extreme collaboration capabilities are following Google’s Apps – not innovating the market. Nevertheless, the Lintra solution impressed me technically as the public cloud service was complemented with more private clouds for example for people relevant data into one hybrid cloud offering to comply with German privacy requirements. Even more important than the technology is simply the fact that the cloud could reach far more people of this non-profit organization than any traditionally deployed solution could do in an economic scale. The outlook to further collaboration with other organisations for major events or even possible catastrophy staffing&logistics is an outstanding usage of cloud computing technology. You could never have achieved this reach or find an affordable model without the cloud. yQ-it/Naturheilzentrum Seckenheim: Based on the ERP system “SilvERP” by yQ-it, the Naturheilkundezentrum Seckenheim, a local chiropractic office, developed jointly a vertical solution for chiropractics. While the technical implementation was lead by the small yQ-it vendor, the vertical specific knowledge came from the Naturheilkunde Seckenheim staff. This first chiropractic customer is now even so enthusiastic about the solution that they started a second brach of business and sell the solution to other chiropractic offices. The solution impressed me as the pure cloud-only solution was technically well implemented and showed that a small software vendor with less than 10 people can still compete against the mega-ERP-vendors, if they find the right co-innovation model in a target vertical.